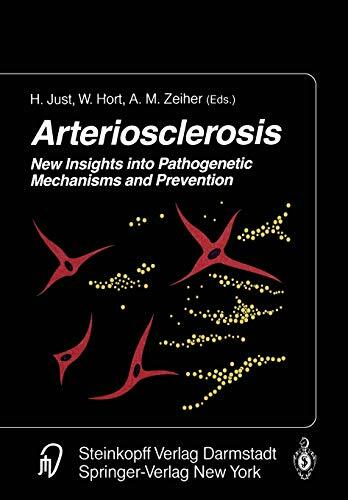 A vast literature has been concerned with arteriosclerosis and yet, many aspects of pathogenesis and of the mechanism of development of the arteriosclerotic vascular lesion remain only poorly understood. In recent years, our knowledge of the earliest stages of arteriosclerosis have greatly improved. By now, we have learned to relate morphologic changes to disturbances in function. It has been of particular impor­ tance that components of the arterial wall could be analyzed in regard to dysfunction, for example, in the endothelium or the vascular smooth muscle. The interaction of the different morphological components of the vascular wall could thus be much bet­ ter understood. Likewise, the interaction between the arterial wall and the flowing blood could be much better described, including the intimate relationship between platelets and the endothelium, the coagulation system and the endothelium, the granulocytes and the endothelial cell layer, as well as processes of migration of blood cells into the subendothelial space. The recognition of functional and morphological disturbance has attained clinical significance not only because the arteriosclerotic diseases have quantitatively reached the dimensions of an epidemic, that is, of a magnitude never been witnessed. It is also because of the development of new drugs that interfere with the atherogenic process and thereby prevent the development of the disease or halt its progression. It is also becoming increasingly possible to inhibit the occurrence of complications in existing arteriosclerotic lesions in manifest disease, i. e.